What do commodity prices tell us? The U.S. economy grew at a somewhat disappointing 2.5% annualized rate in the first quarter. 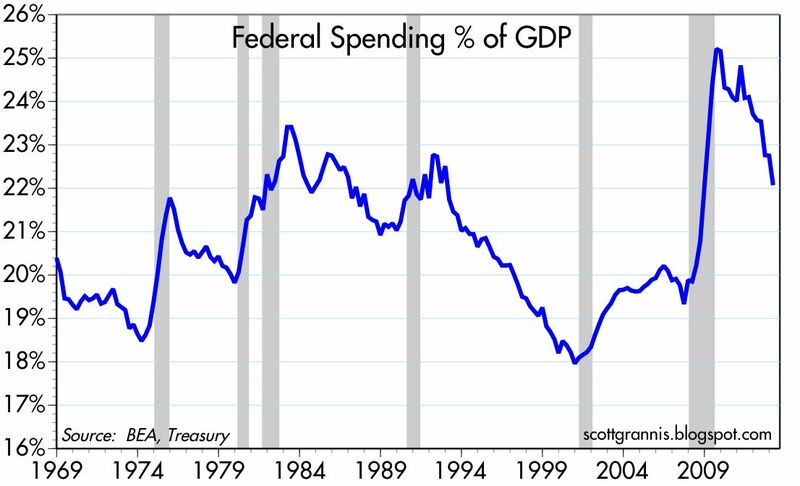 However, if we exclude the first quarter decline in government spending (mostly related to cuts in defense spending), the increase was a more respectable 4%. This is an under-appreciated story: the private sector is doing reasonably well (much better than the GDP number suggests), even though the public sector is shrinking. In fact, it's probably more accurate to say that the private sector is doing OK because the public sector is shrinking. The advance estimate of GDP growth for the first quarter was less than the economy's long-term average growth rate of about 3%. As the chart above shows, the economy is thus slipping further and further below its trend. 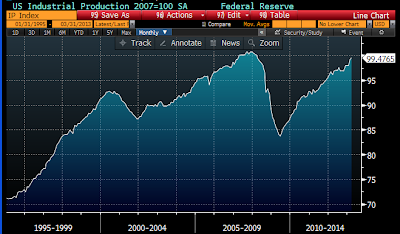 This continues to be by far the weakest recovery in modern history. 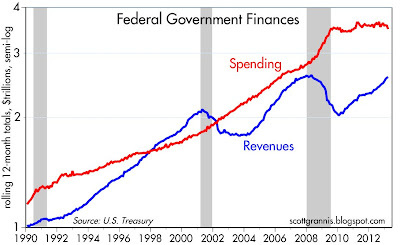 As this next chart above shows, federal government spending has been flat for the past several years, and it has declined in the past several months, mainly due to declining defense spending. This has contributed to reported GDP growth coming in below expectations, but is that really a bad thing? 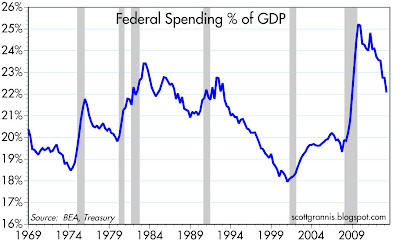 The first of the two charts above shows how much federal spending relative to GDP has declined in the past 3-4 years. 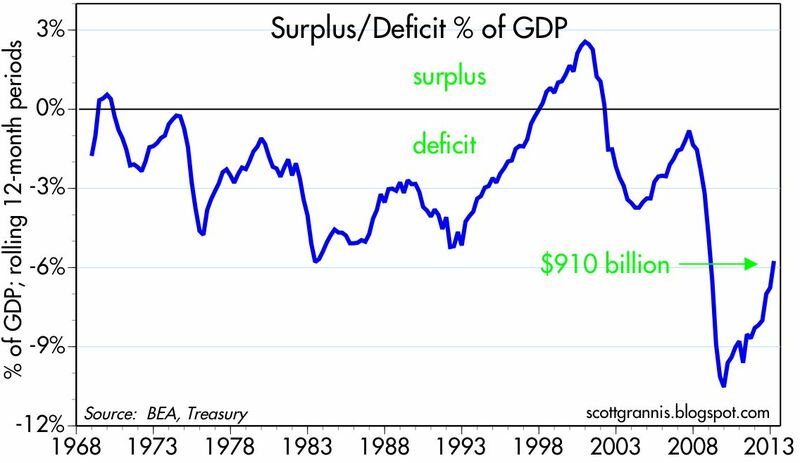 The second chart shows the dramatic reduction in the federal deficit that has resulted from flat to lower spending and increasing tax revenues: the federal deficit has collapsed, from a high of 10.5% of GDP to only 5.75% today. These are arguably the biggest under-appreciated economic facts of recent years. 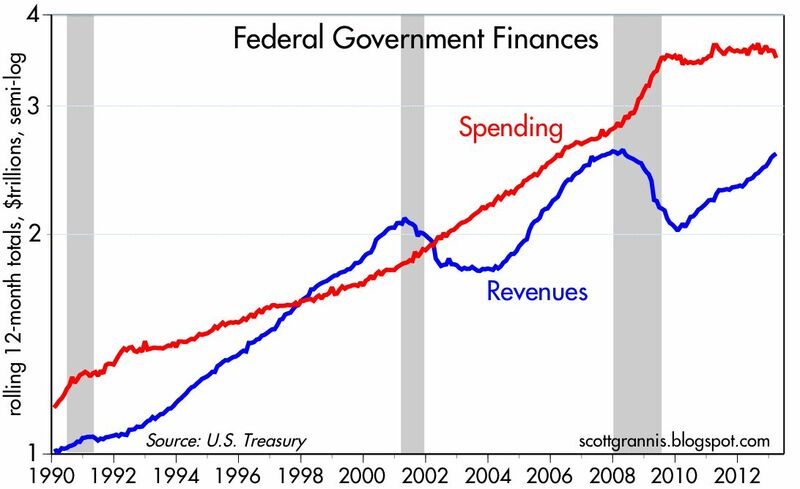 Since federal spending is not growing, the federal government is shrinking relative to the economy at a fairly rapid pace. Since the economy is growing, especially the private sector, tax revenues are rising much faster than overall economic growth. Combined, these two developments have resulted in a major decline in the burden of the federal deficit. Four years ago, no one forecast that this would happen, much less to this extent. What we see here is not only unprecedented but totally unexpected, and that is a big—and very positive—change on the margin. Fully 63% of the "stimulus" spending was income redistribution in disguise (i.e., tax benefits and entitlements). And if you reclassify things such as education, housing assistance, and health as transfer payments, then over 75% of the $840 billion allocated to "stimulus" was essentially income redistribution. Only 8%—$65.5 billion—went for transportation and infrastructure (i.e., the "shovel-ready" projects that would put American back to work). Not a dime went to increase anyone's incentive to work harder or invest more. Why the slow growth? I think the recovery has been very sub-par for a variety of reasons. For one, government transfer payments and government spending in general do little if anything to grow the economy. The government is an inefficient allocator of economic resources, and big spending inevitably entails crony capitalism (e.g., Solyndra), corruption, and waste. Transfer payments create perverse incentives, rewarding those who don't work and penalizing those who do. 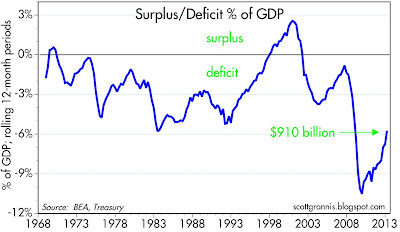 In other words, one reason the economy has been expanding slowly is because we've been wasting scarce resources in a big way, starting with the big "stimulus" spending of 2009. Two, the expansion of the size and scope of government has also entailed huge new regulatory burdens (e.g., Frank-Dodd), and the looming introduction of Obamacare has created great uncertainty among many small businesses since it threatens to significantly increase their costs. For example, small businesses with fewer than 50 employees face huge marginal cost increases if they expand, since they would be forced to either pay a stiff penalty or provide costly insurance to their employees. With businesses unwilling to expand, millions of the unemployed have confronted the dearth of new jobs and decided to drop out of the labor force, hence the relatively high level of unemployment. Unfortunately, even though the burden of government (i.e., spending relative to GDP) is declining—thus giving more breathing room to the more productive private sector—government-induced headwinds are scheduled to increase significantly next year if Obamacare is fully implemented, and that has already been holding the economy back. Also, it's likely that entitlement spending will increase in the next several years due to aging baby-boomers. So while the recent and ongoing decline in the burden of government spending augurs well for future economic growth, the gains are likely to be muted unless regulatory burdens are reduced and entitlement programs are reformed. If there is a silver lining to this big-government cloud, it's the growing realization that Obamacare is not going to work as advertised. Max Baucus' decision to not run for re-election in Montana next year is likely due at least in part to his fear that Obamacare will be a train wreck. Since I don't see how Obamacare can work well, much less be implemented on time, I think there is a reasonable chance that before the end of this year Congress could decide to postpone its implementation for at least a year. That could be a very positive development. As the above chart shows, housing prices according to both the Case Shiller index and the Radar Logic index are up about 10% in the past year. 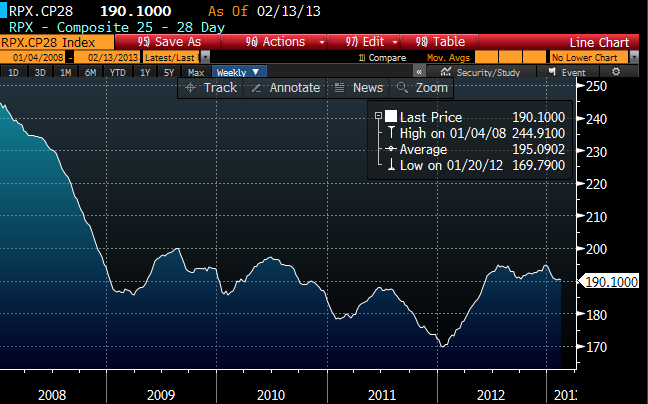 The Case Shiller index is now at a post-recession high. Prices have been relatively flat for the past four years, and on the margin they are showing rather impressive strength. 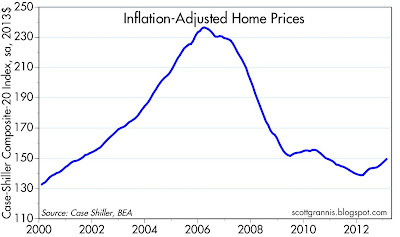 The chart above shows the Case Shiller home price index adjusted for inflation. Real home prices according to this index have yet to post net gains since the recession, but they are down fully 37% from their 2006 highs. 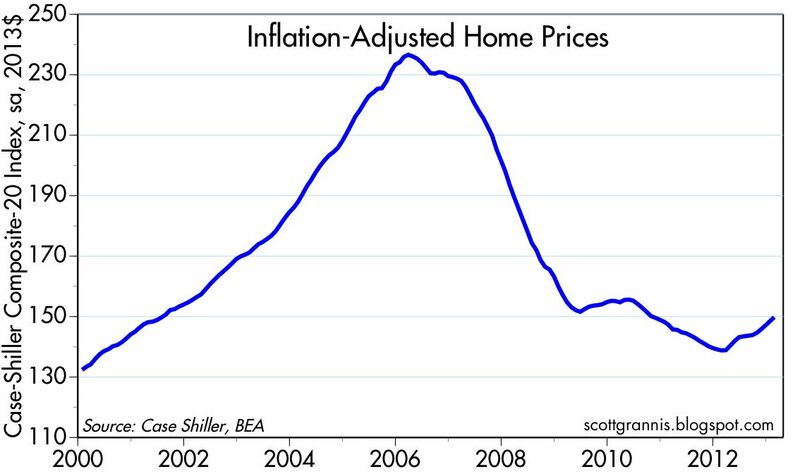 If the prices of houses was a bubble, it has certainly burst. Four years of consolidation is enough to warrant the supposition that housing prices are more likely to rise than decline in the years to come. 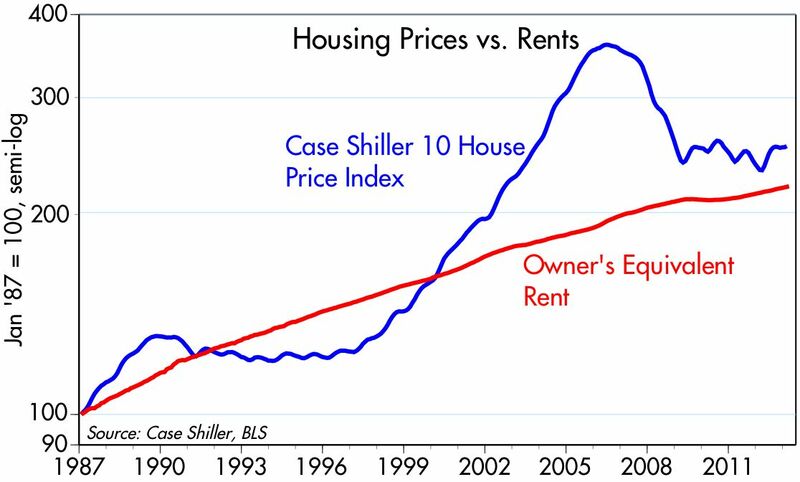 As the chart above shows, housing prices and rents are coming back into line, after prices shot up to unreasonably high levels. 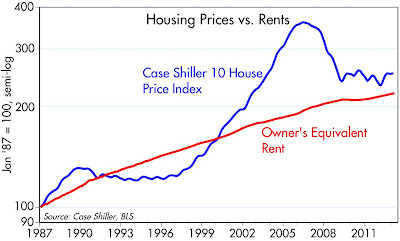 Owner's Equivalent Rent is an important component of the CPI, and is used instead of housing prices; that served to insulate the CPI from the housing price runup in the early 2000s, and from the housing price collapse that followed. Lots of evidence here to support the notion that housing prices have fallen enough to equilibrate demand and supply. 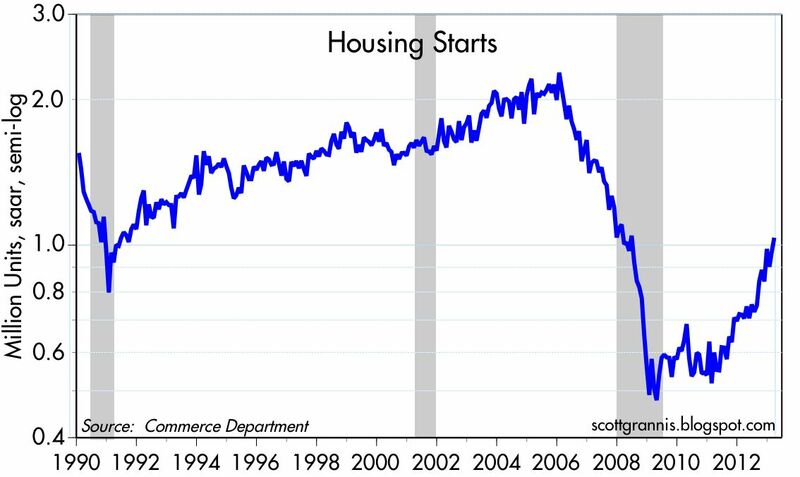 When coupled with the fact that new home construction has almost doubled in the past two years, the housing market recovery appears to be well underway. In a recent post, Mark Perry noted that last year "America had the most energy-efficient economy in US history." 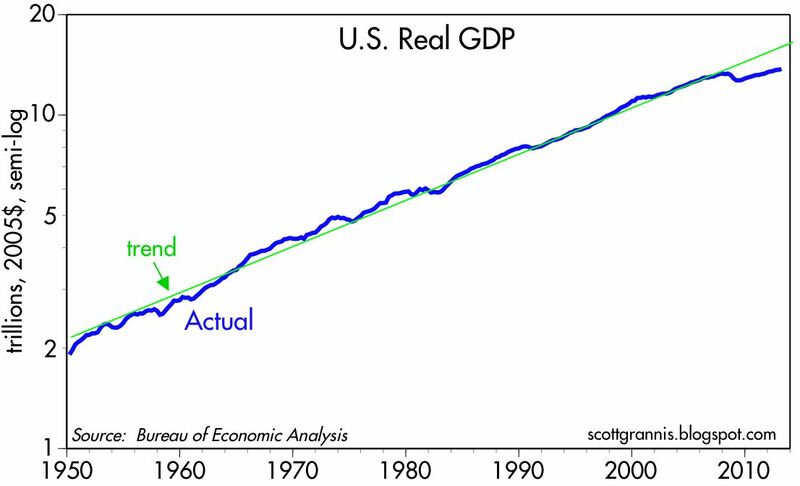 He has a nice chart showing how much less energy (total energy) it takes today to produce a unit of GDP. This is such a big, untold story that I thought I would piggyback on his post and highlight how much less crude oil and petroleum products it takes to produce a unit of GDP, and what this tells us about a potential solution to the problem of healthcare. 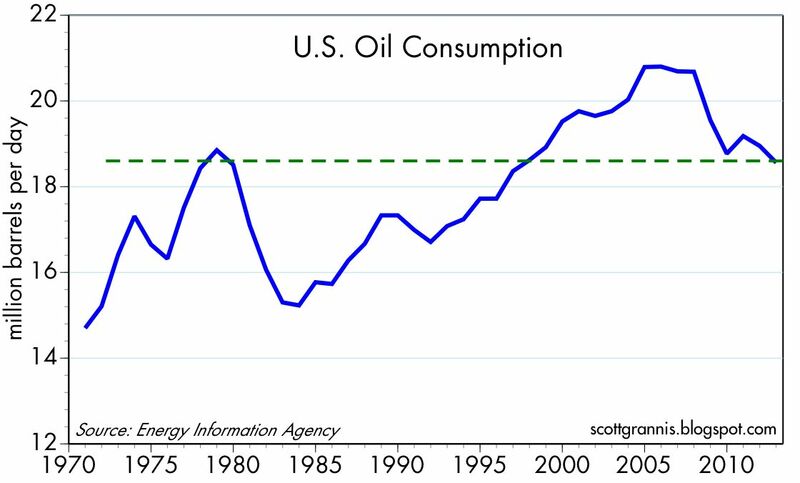 This first chart shows that U.S. economy consumed the same amount of oil last year as it did in the late 1970s. This, despite the fact that the economy today is 133% larger than it was back then. 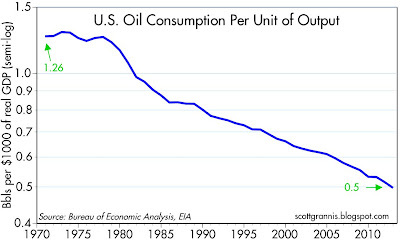 The U.S. economy has more than doubled in size over the past 33 years, but it consumes the same amount of oil. 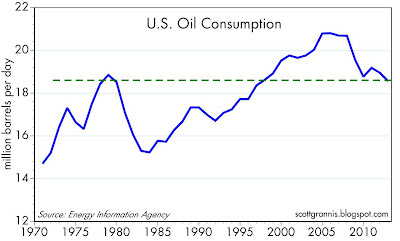 This next chart shows the ratio of oil consumption to GDP. 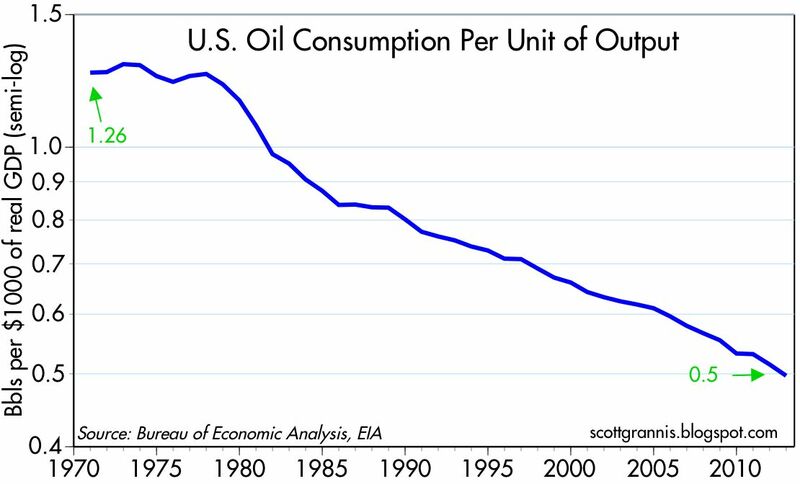 From the peak in the early 1970s, U.S. oil consumption per unit of output has fallen by an astounding 61%. 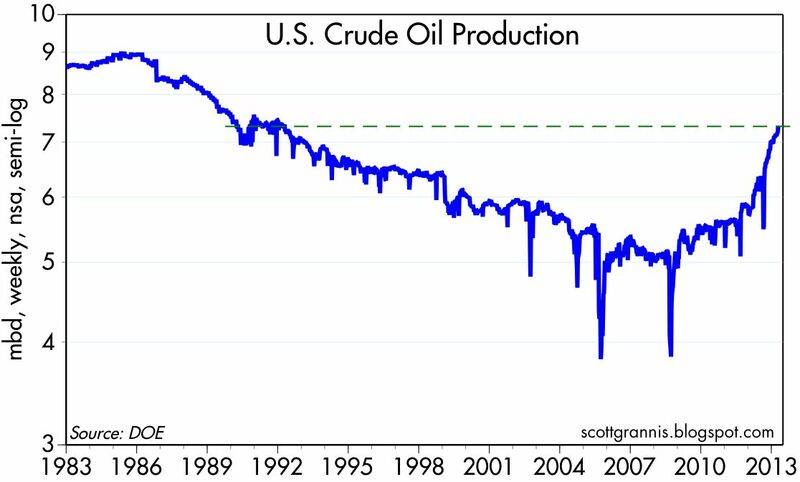 The other nice thing to note on the energy front is that U.S. crude oil production has jumped 47% in the past four years. In the past year alone, crude production is up by almost 20%, thanks mainly to new fracking technology. 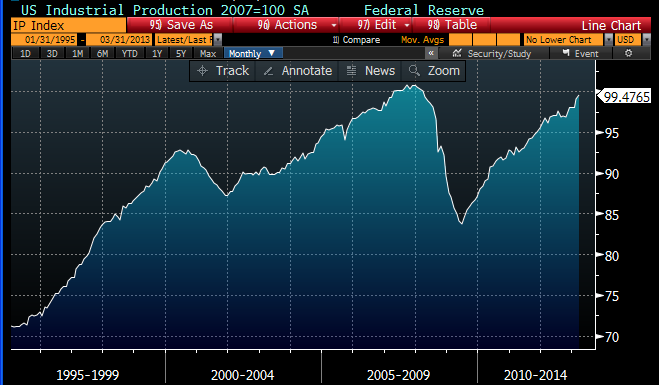 Crude production is surging, but our consumption of crude is not, thanks to ongoing gains in energy efficiency. All of this is symptomatic of a very dynamic economy. 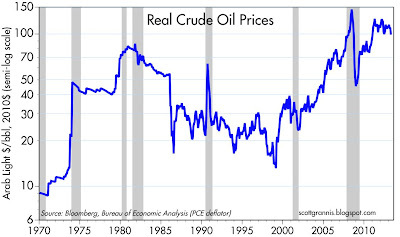 As the above chart shows, the real price of crude oil is very expensive from a long-term historical perspective. Rather than suffocating the economy, very expensive energy has sparked incredible conservation efforts, technological innovation (e.g., fracking) and efficiency gains, with the result that energy today consumes just under 6% of the average person's consumption, a little less than the average of the past 50 years. The point here is that over time our economy responds very impressively to changing prices and fundamentals. There are lots of headwinds working to slow economic growth in recent years (e.g., government spending as a % of GDP is relatively high, regulatory burdens are exceedingly high, many millions have dropped out of the labor force, corporations are reluctant to reinvest their profits, and Obamacare threatens to disrupt almost one-sixth of the economy), but that's not a reason to give up hope. 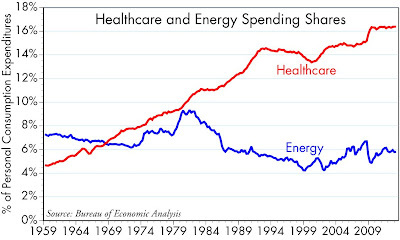 This last chart highlights the huge contrast between spending on healthcare and energy. 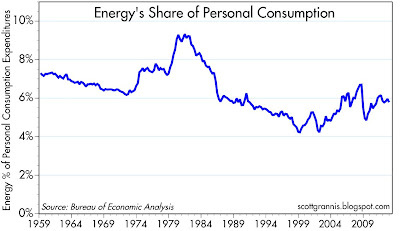 The energy market is largely deregulated, and responds dynamically, as shown in the previous charts, to rising prices. The healthcare market, in contrast, is highly regulated and distorted by the tax code (which only allows employers to deduct healthcare costs, thus resulting in a system where almost no one pays for their healthcare expenses out of pocket—otherwise known as the third-party payer problem), and it has not responded at all to rising costs. 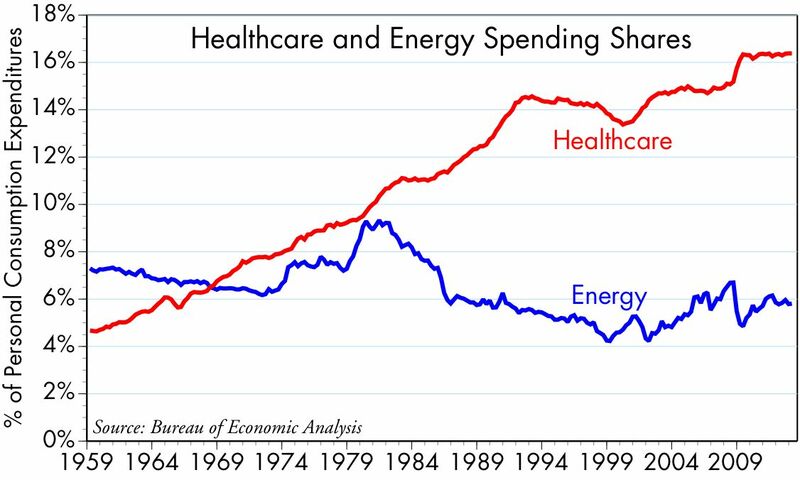 Because of oppressive government regulations and regulatory structures, the healthcare industry has not been able to innovate or implement the kind of efficiencies that the energy market has. Market forces are suppressed, and innovation therefore has been largely suffocated. If we want real improvement in healthcare, we need to restore market forces to the healthcare market. A few examples: Change the tax code so that everyone can deduct healthcare expenses. Encourage employers to turn the choice of healthcare coverage over to the employee—if everyone bought their own policy, the portability "problem" would cease to exist. Allow insurance companies to compete by selling policies across state lines. Eliminate government-mandated benefits which inflate policy costs and discourage innovation and consumer choice. Weekly claims for unemployment continue to show no sign of any unusual weakness in the labor market, as they continue their multi-year decline. 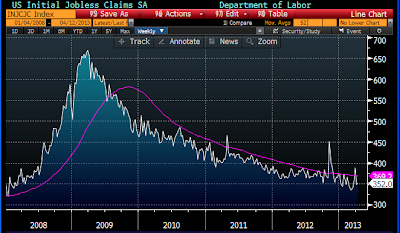 Meanwhile, the number of people receiving unemployment insurance has fallen by 1.2 million, or 19% in the past year. These are significant facts that all but rule out a recession. This chart shows unadjusted claims since the beginning of 2011 and their 52-week moving average, which remains on a slowly declining trend. The number of persons receiving unemployment insurance has fallen by more than 5 million in the past three years. 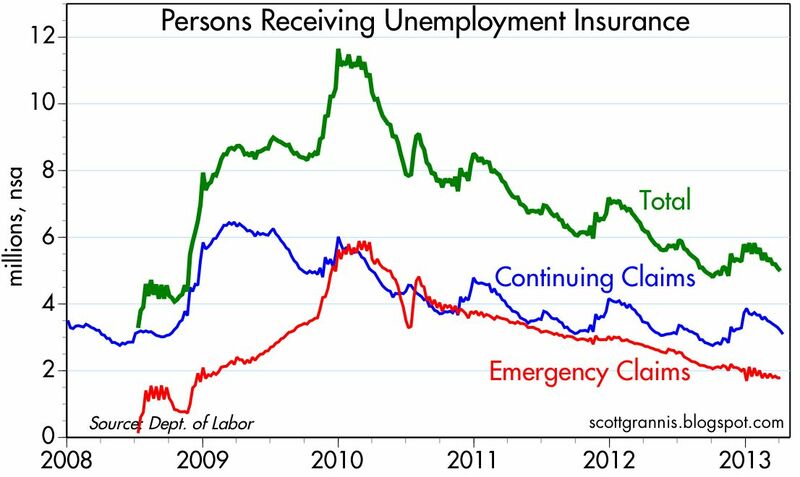 It was boosted far beyond what was typical in prior recessions by Congress' decision in mid-2008 to grant "emergency claims" benefits which greatly extended the time that an individual could collect benefits. Emergency claims have now fallen from a high of almost 6 million to 1.8 million today, and the number is still declining. Politicians think of emergency claims as a way to help those who lost a job, but economists think of them as headwinds to recovery, since they reduce individuals' incentives to return to work and thus act like a headwind to growth. 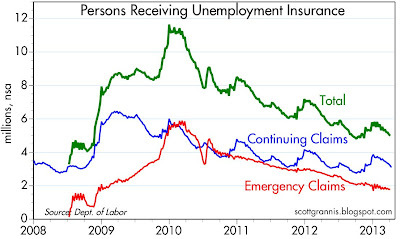 Emergency claims have good intentions, but in the end probably do more harm than good; so it is good that they have declined by almost two-thirds from their early 2010 high. On the margin, the perverse influence of policymakers on the economy is diminishing, and that allows the natural forces of recovery more breathing room. I've learned to never underestimate the U.S. economy's ability to overcome adversity, and there is more reason every day to continue to follow that advice. The economy is very likely to continue to grow, and that's all that matters for investors in today's zero-interest-rate-cash environment. In March, the nation's trucks hauled almost 4% more tonnage around the country than they did a year ago. This is good evidence of the increased physical size of the economy and its continued overall growth. 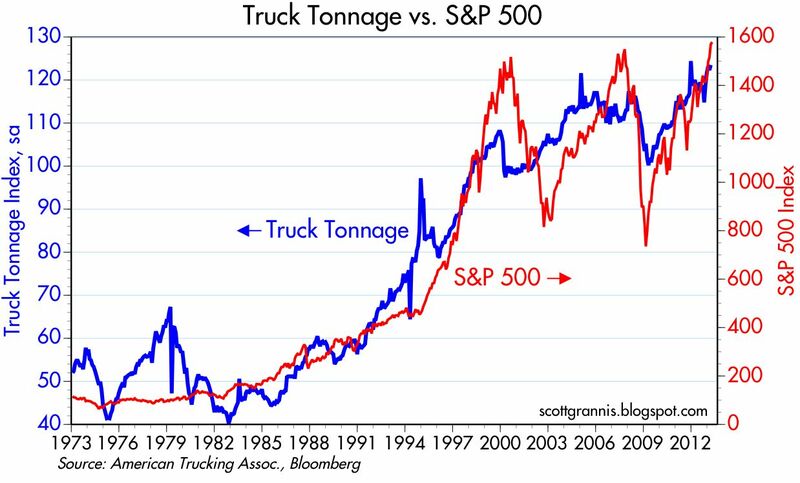 The top chart shows the long-term trend in truck tonnage and how it correlates to the level of the S&P 500. If anything, it lends credibility to the rise in equity prices, since it shows that equities have risen pretty much in line with the expansion of the economy in the past four years. 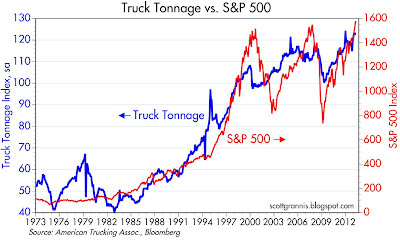 The second chart shows just the truck tonnage index, and how—with the exception of a burst of activity in late 2011 and a weather-related drop in October of last year—the recovery has been relatively steady and constant for the past four years, increasing at a 5% annualized pace since March 2009. 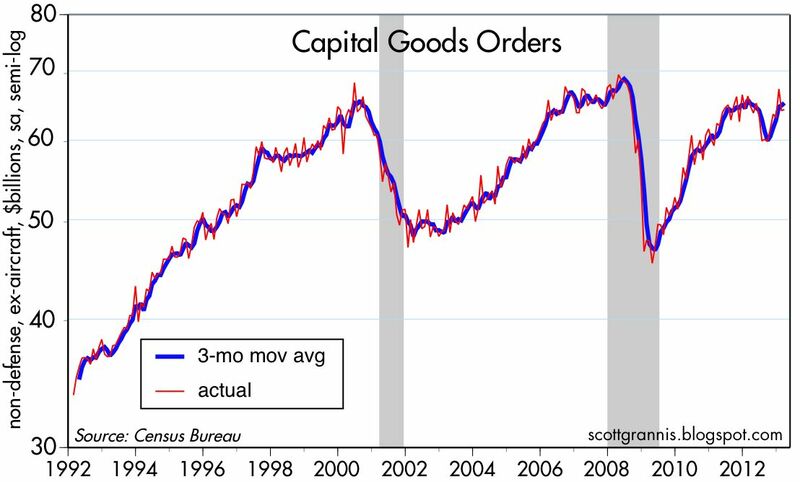 New orders for capital goods in March were substantially less than expected, thanks mainly to a large downward revision to February orders. As a result, capex orders have not increased at all for over a year, although they did rebound significantly from a first-half slump. This is disappointing, since it points to weaker productivity growth in the future (capex is the seed corn of productivity), and a lack of business confidence. This is the core of the economy's biggest problem: a lack of job creation which in turn is the result of business' lack of confidence in the future and reluctance to invest in new jobs, plant and equipment. We'll need to see some real improvement in capex before we can expect a significant improvement in the economy. 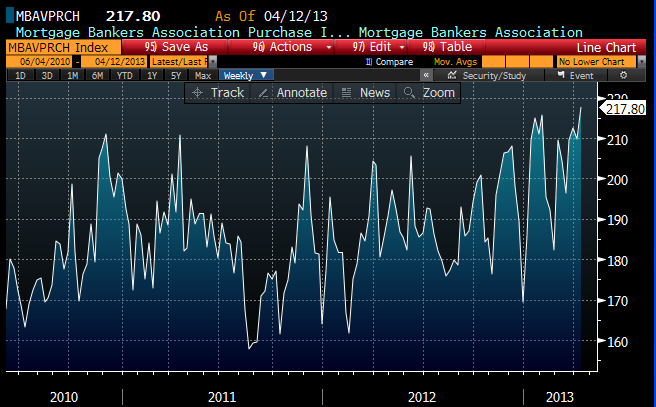 The question for investors, however, is whether this disappointing news runs counter to expectations. 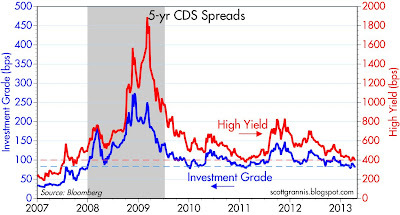 I've long argued that the market has been priced to gloomy expectations, and that can be seen in such things as the extremely low level of Treasury yields; the strong demand for cash, cash equivalents, savings deposits, and safe assets like T-bills and bank reserves; and the below-average level of PE ratios despite record corporate profits. 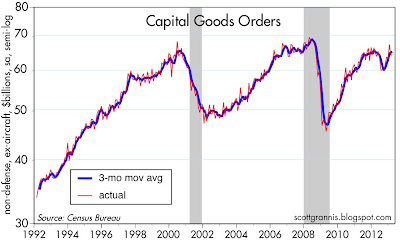 Weak capital goods orders are just another side of what is basically a lack of confidence and a lack of risk-taking. 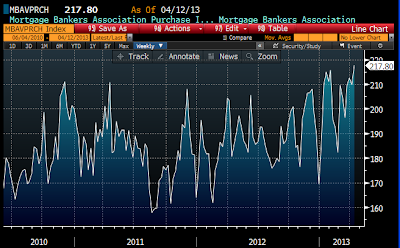 So today's capex news is not "new" news and thus is not disappointing to the market. Indeed, I think the market has been quite pessimistic about the economy's prospects for a long time, to the extent that the market is probably priced to a recession. Thus, anything less than a recession is better than what the market is braced for. As I said in a post back in January, avoiding recession is all that matters. There is nothing in the capex data to suggest we're headed for another recession, and there are quite a few areas of the economy (e.g., housing, auto sales, unemployment claims, industrial production, factory orders, the ISM indices) that are obviously improving, and some by impressive rates. On balance, we're left with what we've known for the past several years: this is a disappointing, sub-par economic recovery. But it is nevertheless a recovery, and that's what matters. 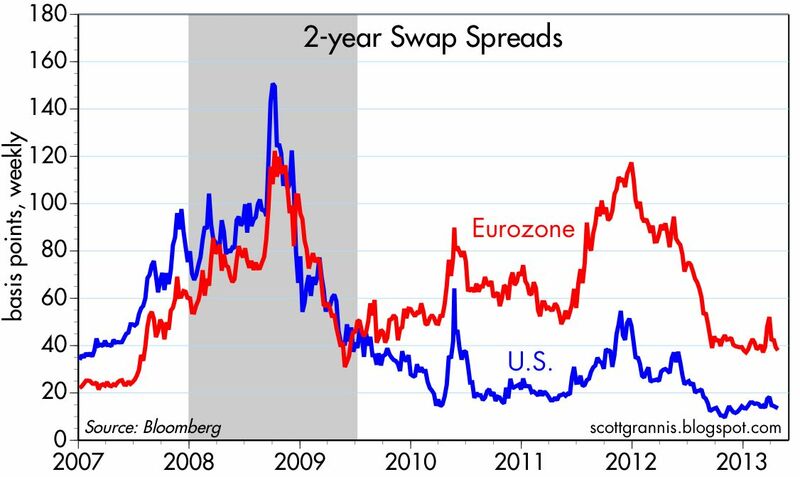 Swap and credit spreads have typically been good coincident and forward-looking indicators of systemic risk and the health of the economy. Currently they are showing no signs of any deterioration, and remain about as low as they have been at any time since the last recession. 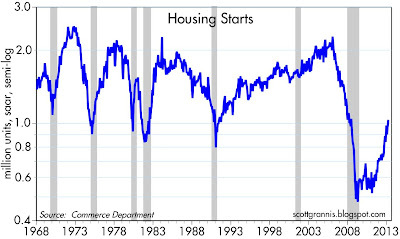 This strongly suggests that the U.S. economy is likely to continue to grow. 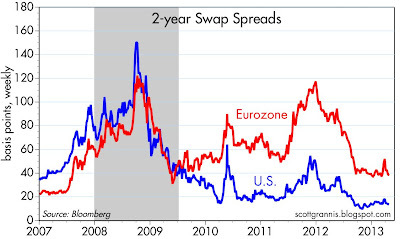 Swap spreads both here and in the Eurozone are relatively low. They were much higher in the runup to the last recession, and in the past few years they have increased from time to time due to concerns about the threat of sovereign default risk in the Eurozone. Currently, however, they show no signs of any unusual sources of risk to the economy. 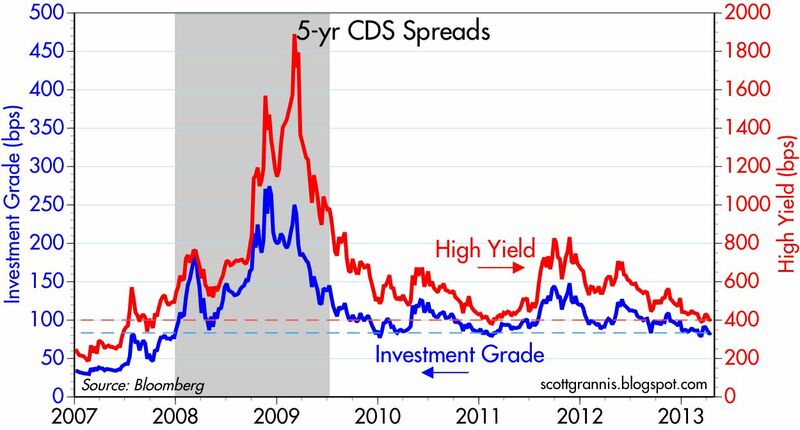 Credit default swap spreads are still elevated relative to where they were in early 2007, but they are as low as they have been at any time since the last recession. There is no sign here of any impending economic weakness or threats to the future cash flows of large corporations. Commodity prices on average are down about 15-20% from their all-time highs two years ago, but they remain very high relative to their 2001 lows. The recent weakness in commodity prices could be explained by slower economic growth here and in places like China, but commodity prices are not weak enough to point to any monetary policy errors (i.e., deflationary risk). 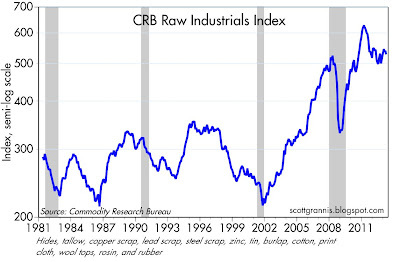 The above chart shows the CRB Raw Industrials Index going back to 1981. This index is composed of basic industrial commodities, many of which do not have associated futures contracts. 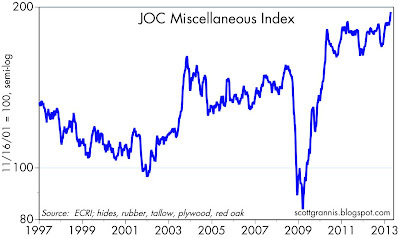 It's arguably the best index to follow for clues as to the health of global manufacturing activity. Prices today are down 15-20% from their recent all-time highs, but remain very high relative to their 2001 lows—130-150% higher. 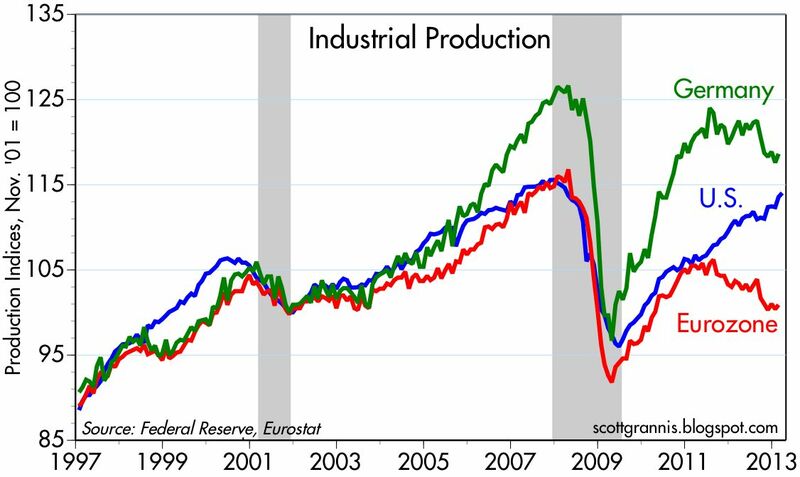 While this is consistent with the observation that economic growth in recent years has been disappointingly slow, prices are still at lofty levels compared to a decade ago, and much higher than what we saw in late 2008 when global manufacturing suffered a major decline. 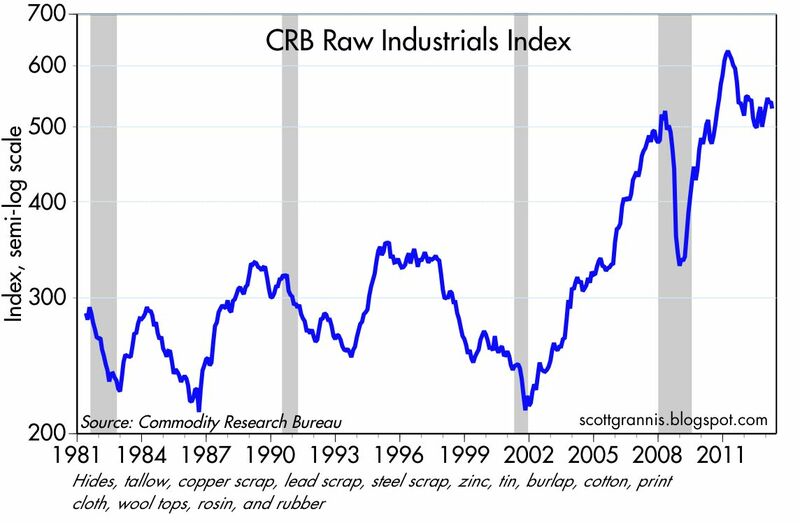 This next chart shows inflation-adjusted value of the broader Spot Commodity Index, which adds foodstuffs to the Raw Industrials Index. 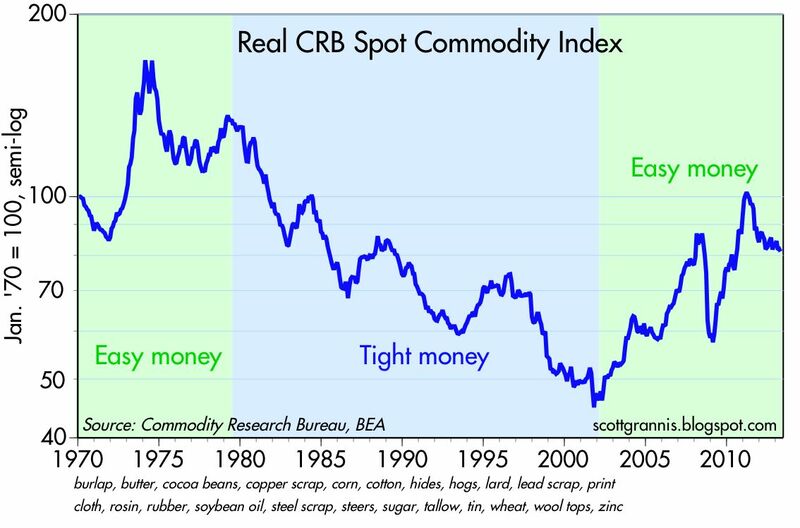 One thing that stands out is that, despite huge gains since 2001, most commodity prices today are lower in real terms than they were in 1970—on average, commodity prices have risen by less than the rate of inflation for over 40 years. 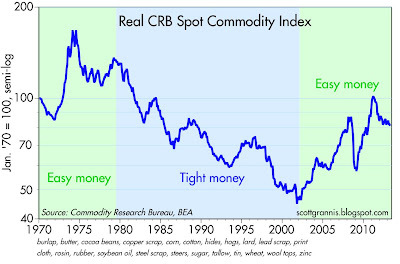 Commodities rose in real terms in the 1970s (after being largely flat throughout the 1960s), a period during which monetary policy was generally accommodative, inflation was rising, and there was lots of speculative purchasing of commodities and other physical assets for their inflation-hedging properties. Commodities fell significantly in the 1980s and 1990s, when monetary policy was generally tight and inflation was falling. The Fed began to ease in 2001, and commodity prices have risen significantly since then, suggesting that—as was the case in the 1970s—monetary policy has played a significant role in driving prices higher in the past decade. From this perspective, it would appear that the Fed's policy accommodation over the past decade has been enough to remove the deflationary impact that monetary policy had on commodity prices in the 1980s and 1990s, but not enough to create new inflationary pressures. 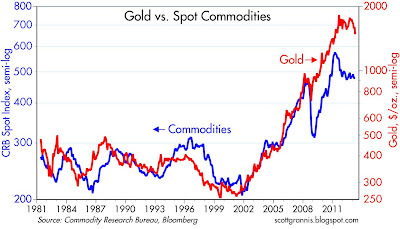 The chart above compares the price of gold with the CRB Spot Commodity Index. 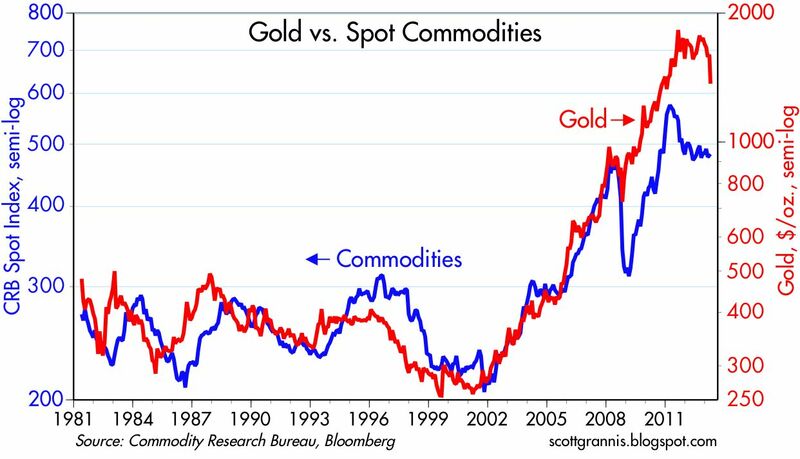 Note that gold tracked the ups and downs of other commodity prices fairly well from the early 1980s until 2011, when commodity prices fell but gold continued to rise and remained elevated. The latest decline in gold could be the market's attempt to realign gold and commodity prices. 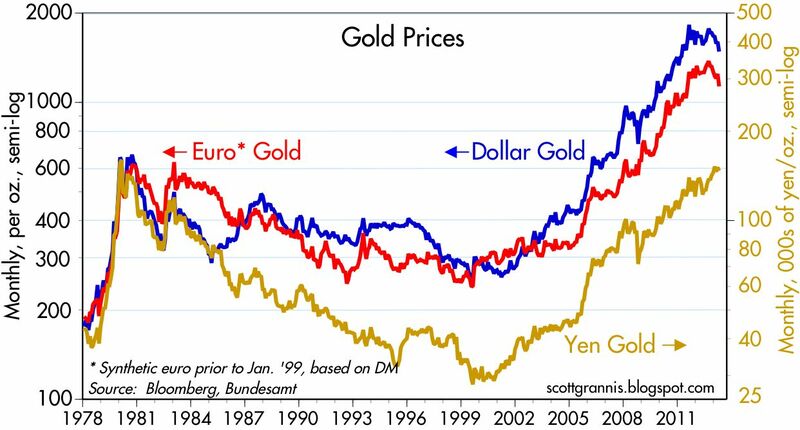 I don't see evidence of deflationary pressures here, but rather a decline in gold prices from what were arguably very high levels that in turn were likely driven by speculative activity and geopolitical risk concerns. The first of these two charts shows the nominal level of crude oil prices (using the futures contract tied to domestic light crude), while the second chart shows the inflation-adjusted level of Arab Light Crude. 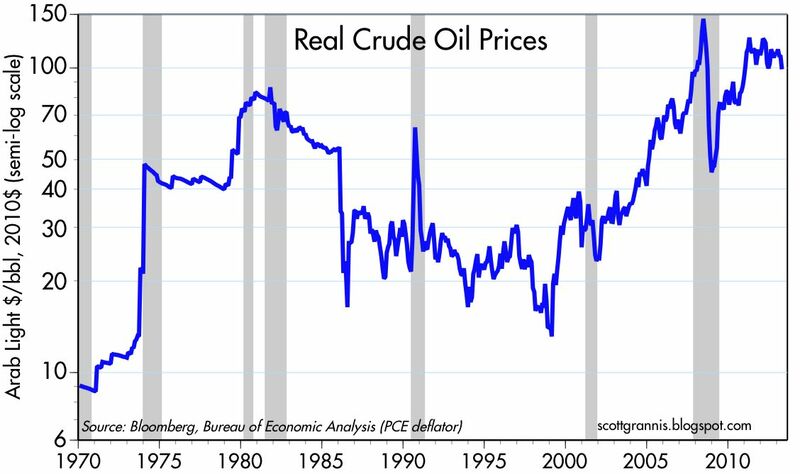 Crude oil is unique among commodity prices, since it peaked in 2008 and is higher in real terms today than it was in 1970 or 1980. 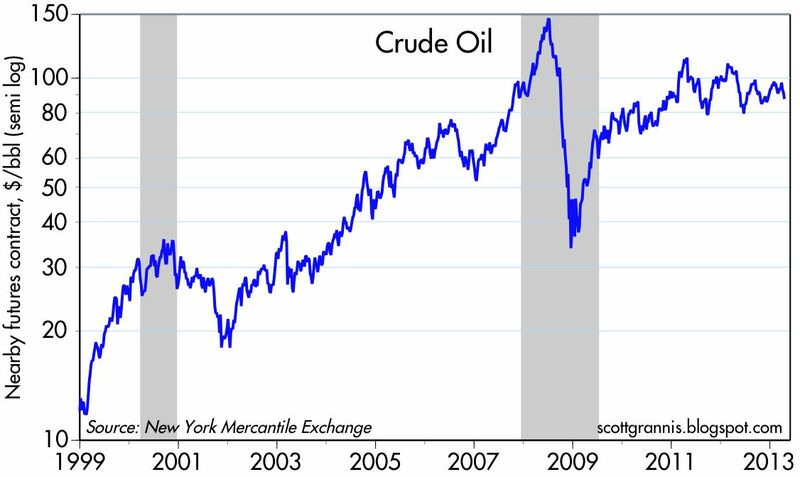 In general, with the brief exception of the spike in prices in 2008, it can be said that crude oil today is almost as expensive, relative to other things, as it has ever been. 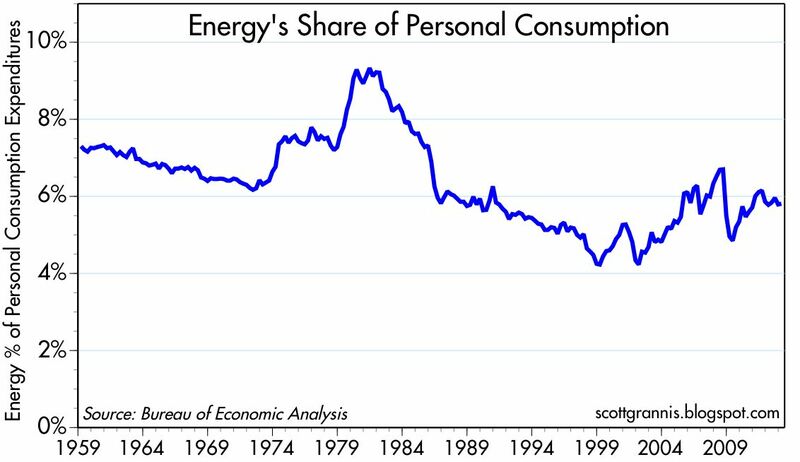 Because energy has become so expensive in real terms, we have found ways to use it more efficiently, with the result that energy consumes a much smaller portion of personal consumption today than it did in 1980 despite being more expensive. Expensive crude prices have also helped bring us the miracle of modern fracking technology, which in turn has given us very cheap natural gas. 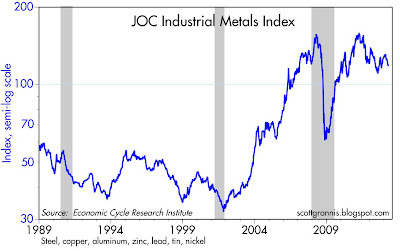 Industrial metals prices tell roughly the same story: prices have been volatile but range-bound for the past 6-7 years, and they are still much higher today than they were at their 2008 and 2001 lows. 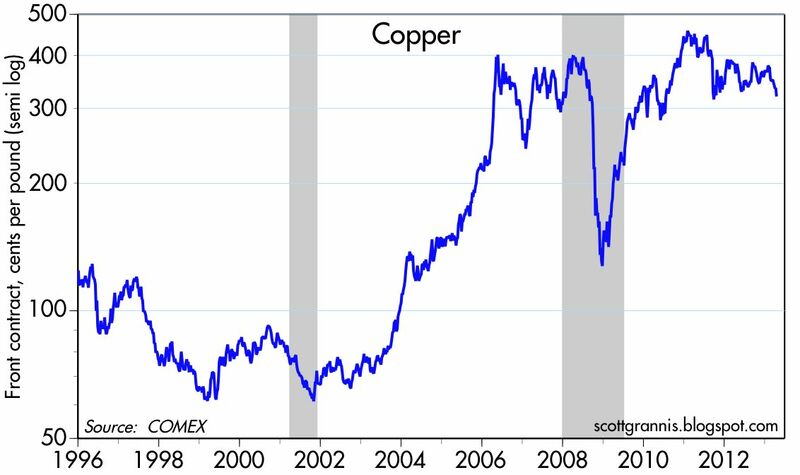 Copper is five times more expensive today than it was in late 2001, while industrial metals prices on average are 3 and a half times more expensive. The thing to note here is not that prices have broken down of late, but that they are still very high from a long-term historical perspective. 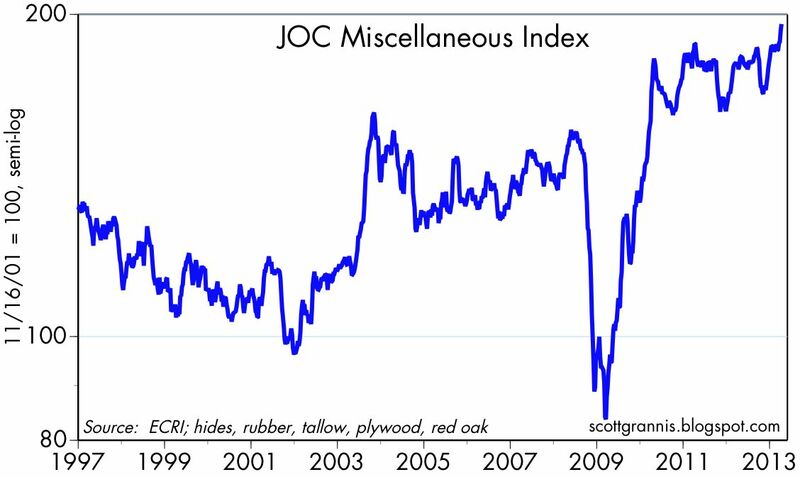 The chart above shows prices for a small basket of relatively obscure commodities (hides, rubber, tallow, plywood, red oak). It is now at an all-time high. No evidence here of any economic weakness. To sum up, I don't see much to worry about in the prices of commodities. They have weakened of late, but on average they remain at levels that just a decade ago would have seemed exceedingly high. 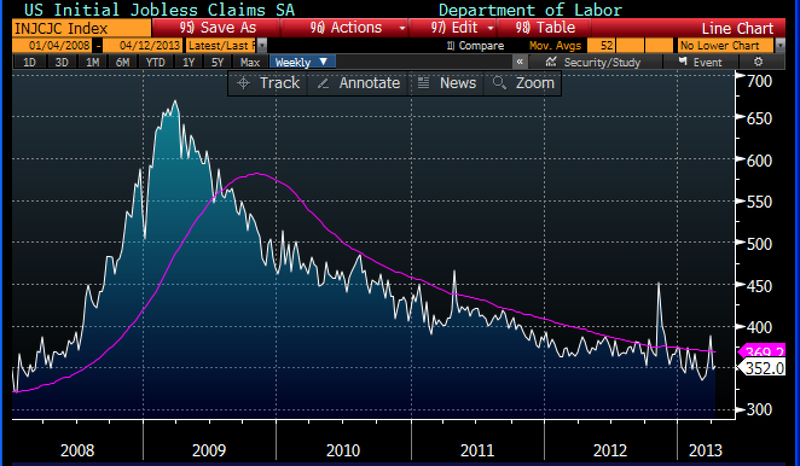 Weekly claims for unemployment continue to slowly decline. 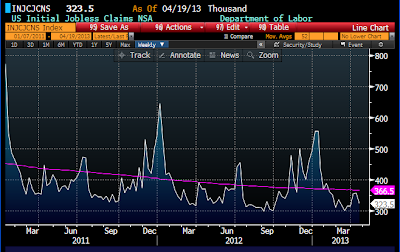 No sign of anything unusual going on in the labor market. That's good, because avoiding recession is all that matters from an investment perspective these days. When yields on risk-free assets are close to zero, it only makes sense to hold those assets if you need liquidity and/or are highly concerned about the potential for losses in other assets, most of which are yielding substantially more, as shown in the chart above. 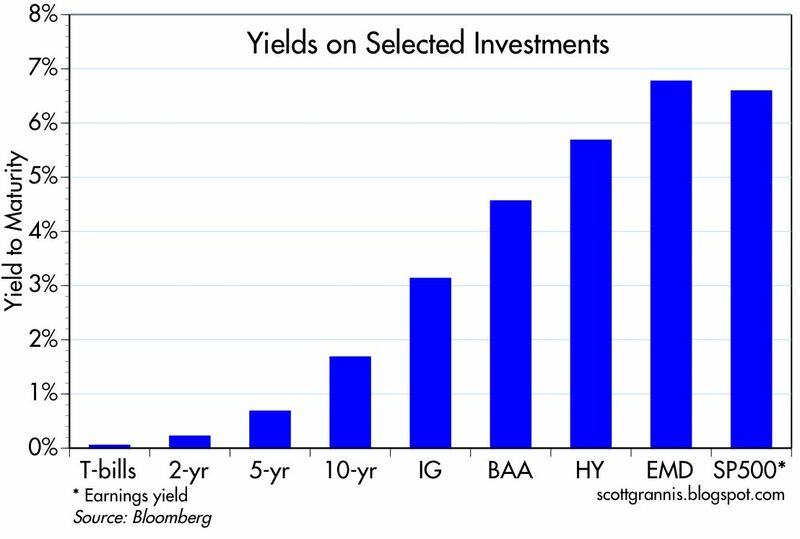 From a macro perspective, the fact that significant assets are being held with virtually a zero yield (e.g., bank savings deposits are now $6.8 trillion, up from $4 trillion in late 2008) can be interpreted as a sign that the market is very worried about a recession, since that is the one event most likely to create widespread losses in risky assets. The chart above is an updated version of the one I posted last month. This is like watching a slow-motion train wreck. Argentina is headed for another big devaluation, and the economy—already suffering from restrictions on imports and capital flight—is going to take a big hit. 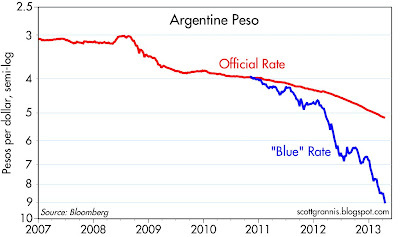 The so-called "blue" rate shows that the market is expecting a devaluation of the official rate of more than 40%. It's starting to get ugly. As I mentioned in my prior post, visitors to Argentina will want to take lots of $100 bills with them, rather than relying on ATMs and credit cards to pay their expenses. 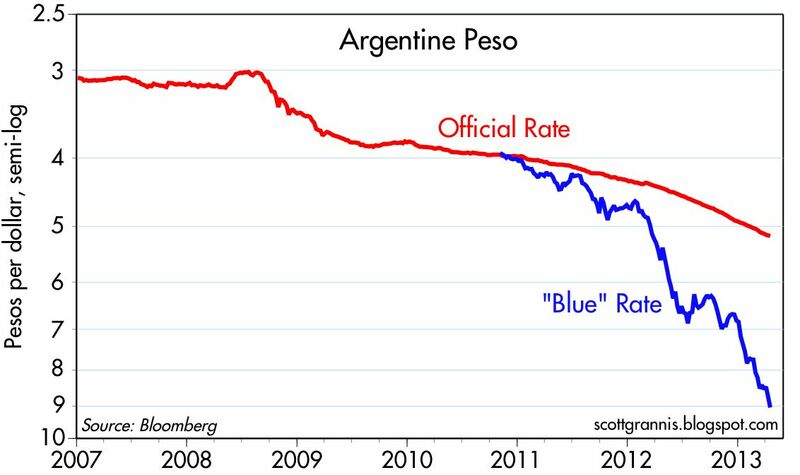 Dollar cash is in huge demand in Argentina, because the central bank is growing the supply of Argentine currency at the rate of 40% per year, effectively debasing the currency in a major way. In a previous post on the subject of gold re-linking to commodities, I mentioned in passing something that Larry Kudlow reminded me of recently: the last time gold suffered such a huge drop (January 1980) was 2 1/2 years before the economic and stock market boom of the 1980s got underway. Lots of things are different this time around, of course, but it's an idea worth fleshing out. The first chart above shows the ratio of monthly spot gold prices to the S&P 500 (just the index, not including reinvested dividends) over the past 85 years, while the second chart shows the ratio of daily prices over the past five years. As should be obvious, we have just seen a significant change in the relative strength of stocks and gold. Stocks appear to be on the cusp of a new trend, rising in terms of gold, and this could portend optimistic tidings. 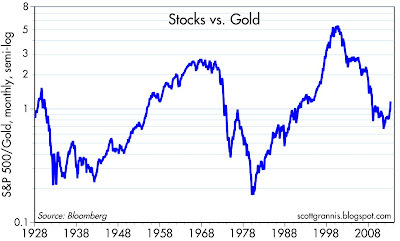 Over the time period of the first chart, there have been only two episodes in which stocks strongly outperformed gold over a sustained period: the first, from around 1950 to around 1965, and the second, from late 1982 through 2000. 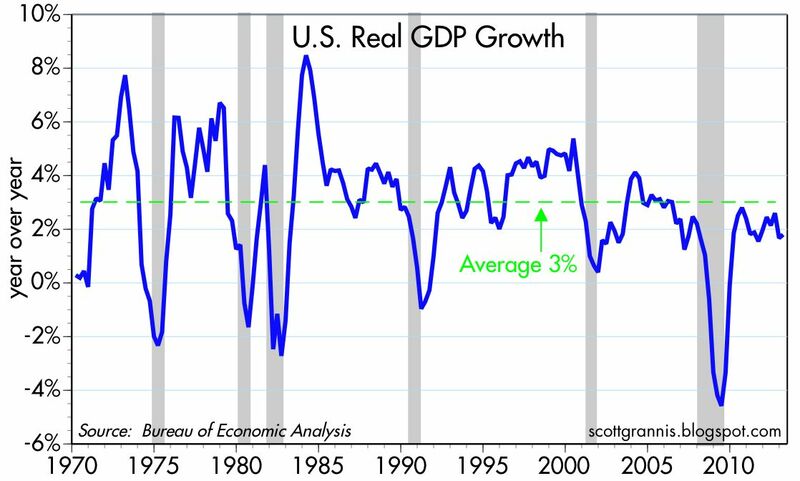 In the first period, real GDP grew at an annualized rate of 4.5%, which is substantially more than the the 3.1% long-term average growth rate of the U.S. economy. 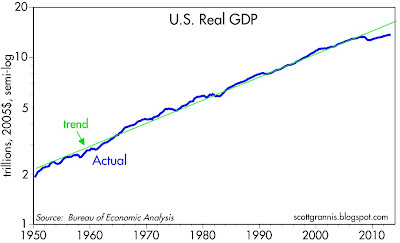 In the second period, real GDP grew at an annualized rate of 3.7%, well above average. 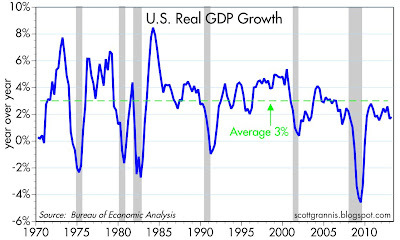 Real GDP growth was below average in the periods during which stocks fell relative to gold, the worst being from 2000 through 2012, when real GDP growth was an annualized 1.6%. 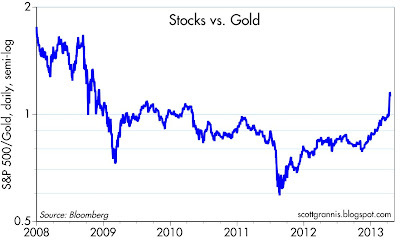 Of course, changes in the ratio of stocks to gold aren't what drives economic growth. Rather, it is strong economic growth that drives stocks higher relative to gold. During periods of healthy growth investors naturally gravitate to equities at the expense of gold, because profits are rising, stocks pay dividends, and gold yields nothing. When growth is weak, uncertainties typically abound, profits are squeezed, and gold gets the nod in favor of equities because speculation tends to supplant investment. The upturn in stocks is thus a preliminary indicator that the economic fundamentals may be shifting in favor of equities, and that, in turn, would suggest that the long-term outlook for the economy is improving. Probably not immediately, but some time in the next few years we could see some genuine improvement in the economic fundamentals. 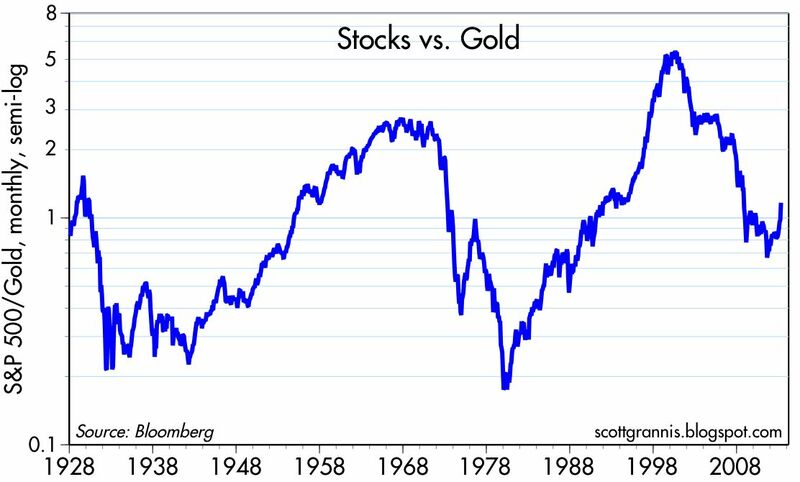 Markets are always forward looking, and this indicator (the ratio of stocks to gold) could be one of the most forward-looking of all. Let's hope so. 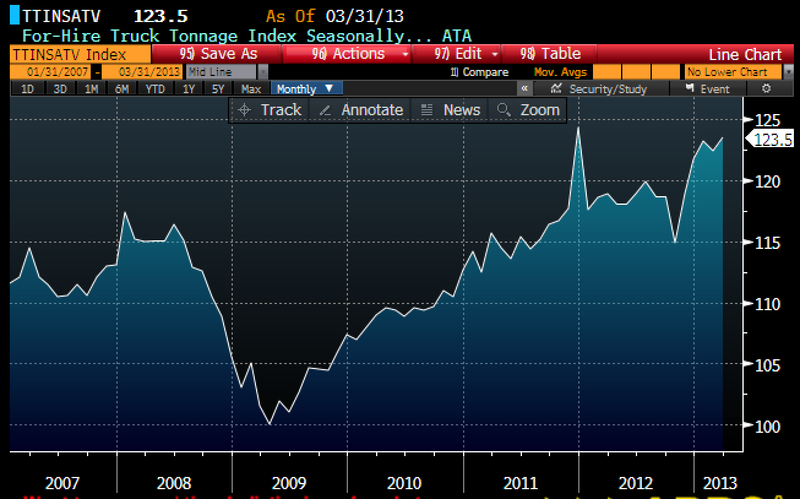 March data released today for industrial production and housing starts show unmistakable signs of growth and recovery. Economic growth in the first quarter of this year is almost certain to be much stronger than the anemic growth of the fourth quarter. Here's a great example of how a sector of the U.S. economy that suffered a devastating blow during the Great Recession has staged a "V-shaped recovery." 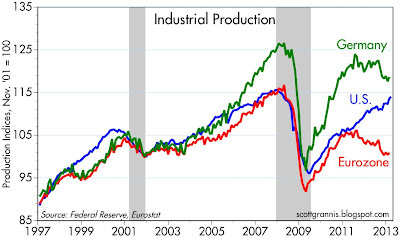 Industrial production has expanded by 19% since its low of mid-2009, and is only 1.4% shy of an all-time high. Production is up 3.5% in the past year, and it rose at an impressive 5.7% annualized rate in the first quarter of this year. 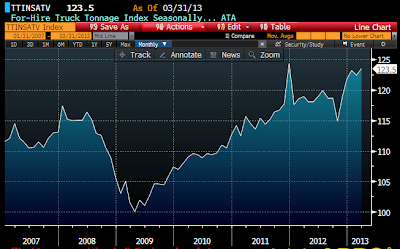 The chart above is a reminder of just how much better the U.S. economy is performing than the Eurozone economy. The Eurozone has been in a recession for almost two years, burdened by the struggling PIIGS economies and the threat of sovereign debt defaults, but the U.S. has shrugged off the problems across the pond and continued to forge ahead. Pessimists focus on the fact that housing starts today are at levels that marked recessions in the past, but optimists focus (correctly) on the huge improvement on the margin. Residential construction has only recovered about half of what it lost in the Great Recession, but gains in the past two years have been nothing short of spectacular. Starts are up 92% since the end of 2010, they have jumped 49% since the end of 2011, and in the year ended March, they are up 48%. These are rather extraordinary statistics. The most beaten-up sector of the economy is coming back to life by leaps and bounds. Why are there still so many long faces out there? This is a followup to my post last Friday, in which I explained why gold's second great rally had ended, and gold's downside risk loomed large. Gold today is down over 11%, to $1350/oz. as I write this. At 11%, that's the biggest one-day decline in over 30 years. The chart above is a good guide to how much downside is left. In short, it looks like gold is on its way to re-linking to commodity prices, with a likely price target of $900-1000/oz. To summarize my argument of last week, in late 2008 gold began to overshoot commodity prices. Call it an "end of the world as we know it" trade. Gold was reacting to fears that the world's central banks were engaged in a massive money printing scheme that would result in hyperinflation, and/or a global currency collapse. Gold was also propelled higher by the Eurozone sovereign debt crisis, which many thought would lead to the demise of the Euro, and by fears of exploding sovereign deficits that might inevitably be resolved by a big increase of inflation. Back in January I had a post that offered yet another explanation for why gold rose so much and was headed for a fall: "Developments in China explain the end of gold's rise." It's worth reviewing and updating, because I think the argument has at least some validity, and because we have fresh data today on China's GDP growth and foreign reserves. What follows is a revised and updated version of my January post. Arguably, there have been only a handful of major developments in the global economy in the past 10-12 years: 1) the Chinese economy enjoyed an unprecedented 10% annual economic growth rate, on average, for most of the past decade, but growth has now slowed to 7-8%; 2) beginning in 2000, China's foreign exchange reserves soared from $170 billion to now $3.4 trillion, and the growth of reserves has now slowed to a crawl; and 3) the price of gold soared 642% from 2001 to 2011, but it has since retreated by almost 30%. It's likely that all three of these developments are related, and that they help explain the recent decline in gold. China's decision in early 1994 to peg the yuan to the dollar was a key factor driving China's growth, since it brought Chinese inflation rapidly down to the level of the U.S., where it has remained ever since. The prospect of a strong and relatively stable currency not only reduced inflation and its multiple distortions, it also increased the market's confidence in China and that in turn helped boost investment in the country. Indeed, since the yuan has only appreciated against the dollar since 1994, foreign investors benefited from strong Chinese growth and yuan gains. China was the boomtown of the century. As the first of the two charts above shows, the huge capital inflows that helped China grow needed to be sterilized or accommodated by the Bank of China, otherwise they would have caused the yuan to soar, and that could have short-circuited China's ability to grow. Massive inflows of foreign capital seeking to benefit from rapid Chinese development essentially forced the Bank of China to buy over $3 trillion of foreign exchange, with a commensurate increase in the Chinese money supply. Converting capital inflows into yuan is the only way foreign capital could actually enter the economy, because you can't build a factory or hire workers with dollars—the dollars need to be converted to yuan, and it is the proper role of the BoC to buy those dollars and issue new yuan in the process. Yet despite massive forex purchases, which relieved pressure on the yuan to appreciate, the BoC still had to allow the yuan to float irregularly upwards, in recognition of China's declining relative cost advantage that in turn was a function of huge increases in worker productivity. At the same time, a stronger yuan helped to keep the inflationary pressures of rapid growth under control. As I explained in this post, it now appears that this process of huge forex purchases and continual yuan appreciation is at or nearing an end. This is a big deal. China's foreign exchange reserves have not increased materially for the last two years, and the yuan has risen less than 1% against the dollar over past five months. Capital flows and trade flows appear to be reaching some kind of equilibrium, just as Chinese and U.S. inflation have converged. 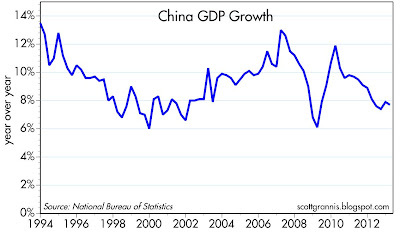 Moreover, China's growth rate has slowed significantly in recent years, as shown in the chart above. 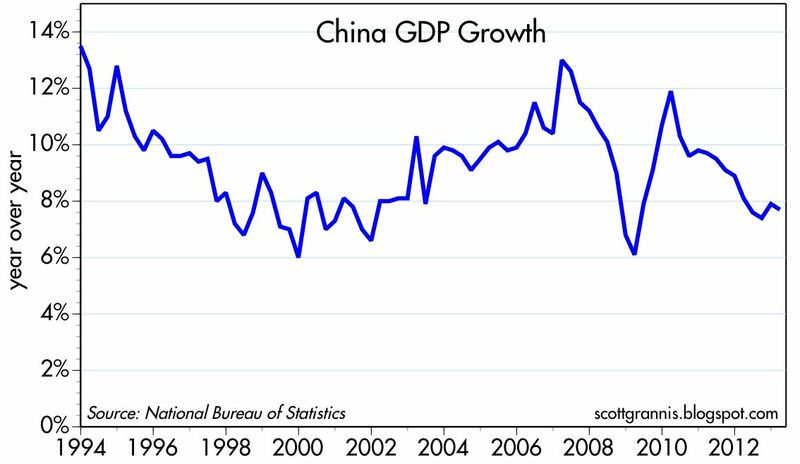 China is now growing at rates similar to what we saw prior to golds' surge. 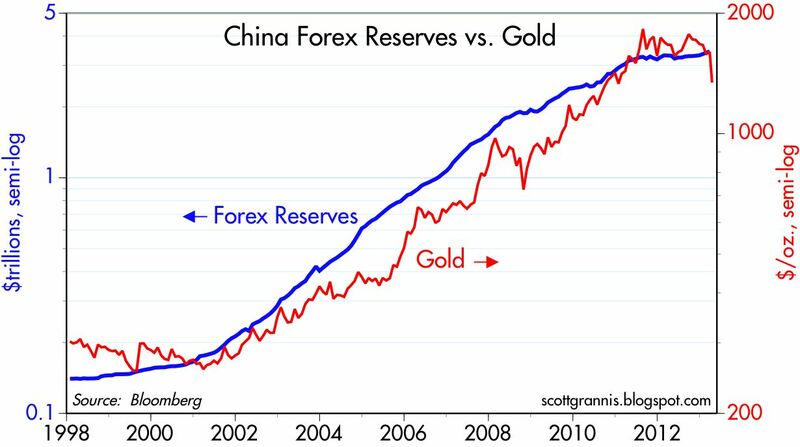 The above chart compares the rise in China's forex reserves with the rise in the dollar price of gold, both of which have been impressive over most of the past 10-12 years. China's central bank started buying up capital inflows in earnest in early 2001, right about the time that gold was hitting a multi-year low. 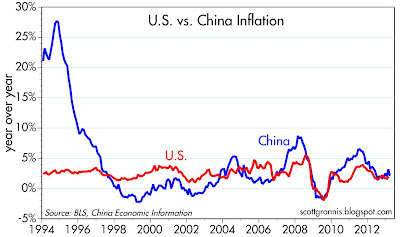 This came to an end in early 2011, as net capital inflows to China approached zero, and shortly thereafter gold peaked. Both forex purchases and the price of gold increased by many orders of magnitude over roughly the same period. 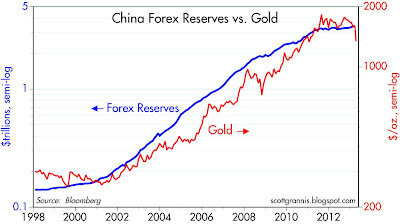 Now, about 18 months after China's reserves have been relatively stable and 20 months after gold hit its peak of $1900, gold has dropped sharply. Is there a plausible explanation for the strong correlation between these disparate variables? I think there is, but I can't say so with authority. Gold bugs like to argue that gold rose because both the Fed and the BoC were "printing money" with abandon. The global monetary base exploded during this period, so naturally gold rose, so the theory goes, because the world was being flooded with fiat currency. Gold was the only port in an eventual inflationary storm. 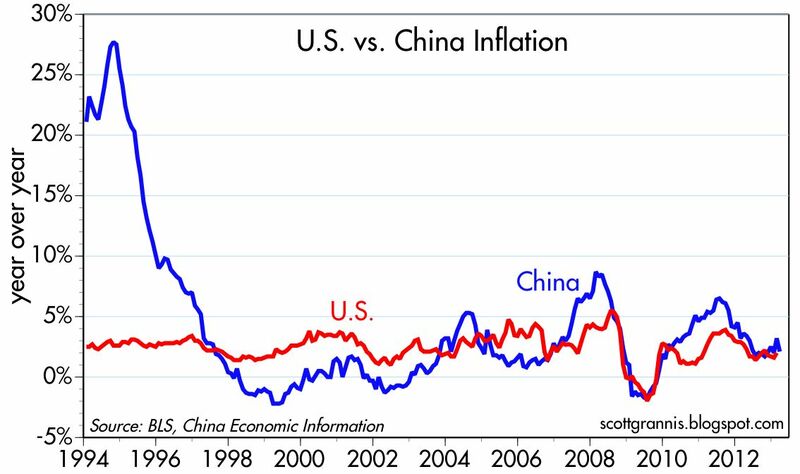 Yet Chinese and U.S. inflation rates are still relatively low. 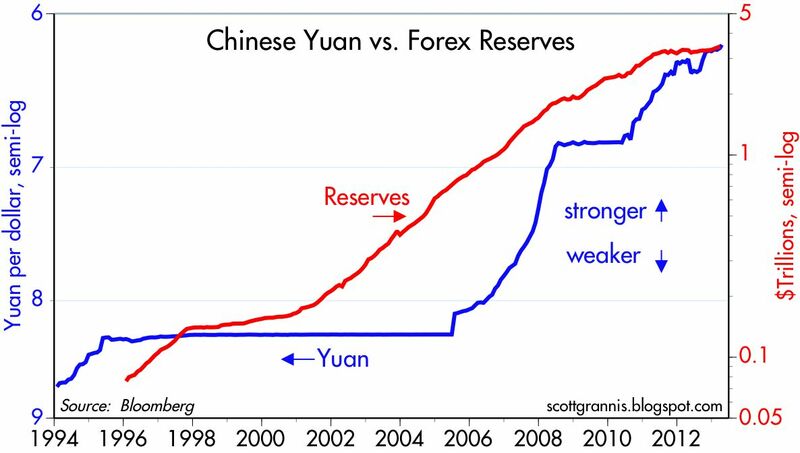 There has been over a decade of impressive expansion of bank reserves and yuan, but inflation has so far failed to show up. As I explained here, the truth is that the Fed has NOT been "printing money" as is widely believed—the Fed has simply been accommodating a huge increase in the demand for safe securities. The BoC hasn't been "printing money" either, because it has simply been purchasing the net inflow of dollars to China and converting those dollars to yuan so they can accommodate the impressive growth of the Chinese economy. Don Luskin, a good friend, got me started down the path to an explanation for how China's forex reserves are connected to the rise in the price of gold. He argues that the outstanding stock of gold is relatively fixed—growing only about 3% per year—but that the demand for gold has jumped by orders of magnitude since China, India, and other emerging markets have enjoyed explosive growth and prosperity gains. In other words, the number of potential buyers of gold has risen much faster than the supply of gold, so naturally gold's price has increased. This is not a story about massive money printing and hyper-inflationary consequences, it is a story about a one-time surge in the demand for the limited supply of gold. That surge in Chinese demand for gold stopped almost two years ago as China's capital inflows have settled down to more manageable levels, and it has exposed the price of gold for what it was all along—a bubble that was inflating and would sooner or later deflate. 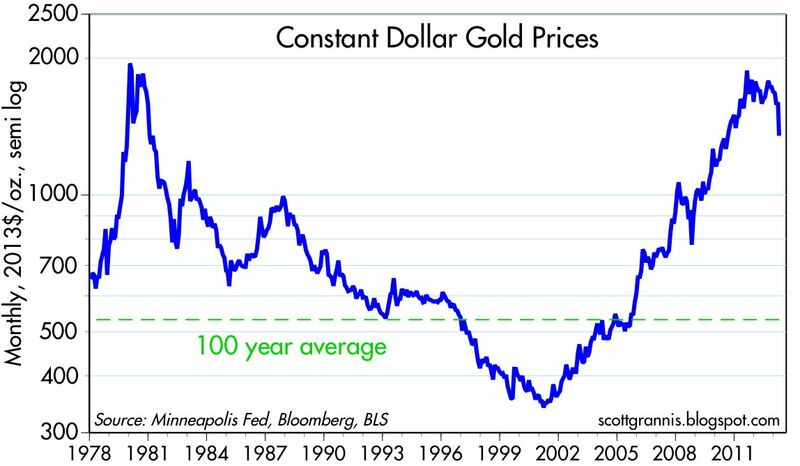 Gold now is coming back down to more reasonable levels, both relative to other commodities and relative to its long-term average inflation-adjusted price, as seen in the chart above. I don't see anything wrong here. This is not a reason to panic, unless you are long a lot of gold. 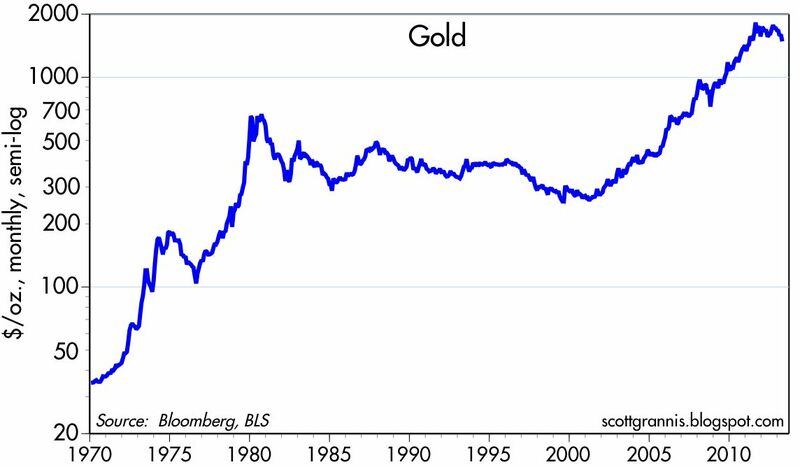 And as Larry Kudlow reminds us, the last time we saw a large and sustained decline in the price of gold—in the early 1980s—it was setting the stage for a multi-year economic and equity boom. The recent 12-year bull market in gold has come to an end. Gold today is 22% below its 2011 high, but it is still 480% above its 2001 low. This could be a wild ride. The first great gold rally occurred in the 1970s, sparked by Nixon's decision to abandon the dollar's link to gold. The Fed had been failing to tighten policy since the mid-1960s, despite continual outflows of gold which were symptomatic of declining dollar demand and rising dollar supply—in short, dollars were in excess supply. Set free, gold rose from $35/oz. to a peak of $850 in January 1980, for a spectacular gain of over 2,330%, and the excess of dollars combined with loss of confidence in the dollar fueled a surge of inflation. That incredible gold rally was brought to an end by Fed chairman Paul Volcker, who in 1979 decided to slam on the monetary brakes in order to bring inflation under control. 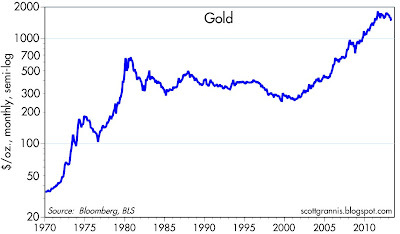 From its peak in early 1980, gold proceeded to fall for the next 21 years. The chart above converts the nominal price of gold, shown in the first chart, into an inflation-adjusted or constant dollar price. This also highlights how significant the big moves in gold were, and how well they corresponded to sea-changes in monetary policy. The big decline in gold from 1980 through 2000 coincided with generally tight monetary policy that brought inflation down from double digits to only 2%. The second great gold rally began in 2001, around the time the Fed realized that it had been too tight for too long and began reducing the Fed funds rate target from 6.5% to 1.75% over the course of that year. The PCE deflator fell at a -0.4% annual pace in the second half of 2001, which was the first time it had ever visited deflationary levels—proof that the Fed had been too tight. As the Fed embraced easy money, gold rose from a low of $256 in early April 2001 to a high of $1900 in September 2011, for a gain of 642%. 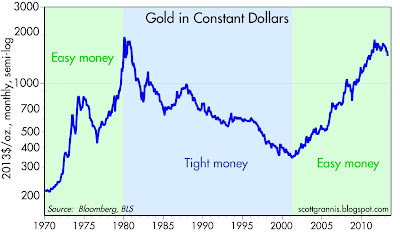 In real terms, gold reached almost the same levels it had in early 1980. The latest gold rally is now over, having fallen more than 20% from its all-time nominal high. Many will speculate about its origins and its recent demise, but for me it is fairly straightforward. Gold rose because it had been suppressed by 21 years of tight monetary policy which ended in 2002. Gold rose because the market began to sense that the Fed was too easy—that lowering the funds rate target to 1% and keeping it there from mid-2003 to mid-2004 was excessive ease—and that it was an inflationary mistake. 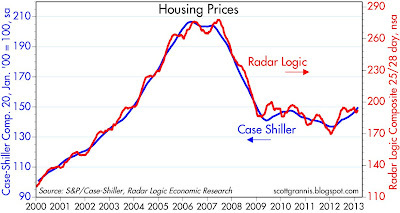 And indeed it was: housing prices soared from 2002 through 2006; commodity prices soared from late 2001 through 2008; and the CPI registered a 5.5% increase in the 12 months ended July 2008. After a brief decline in 2008, when the financial crisis caused a surge in dollar demand that the Fed was slow to respond to, gold resumed its upward climb. 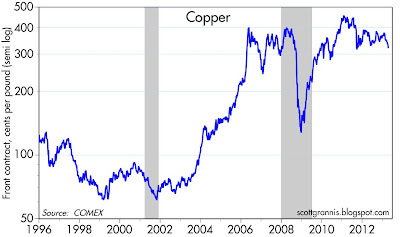 Commodities also suffered in 2008, but even more so than gold because a the global recession destroyed demand. Like gold, commodities then resumed their rally from 2009 through early 2011. Commodities peaked in April 2011, and gold peaked shortly thereafter, in August 2011. 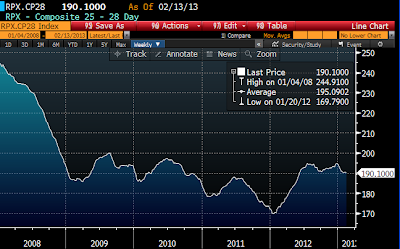 As the chart above suggests, gold overshot commodities prices by a significant amount over the past five years. Speculative fever, as expressed by numerous analysts and pundits who called for gold to rise to $15,000, $20,000, and even $46,000, could be one reason. The Fed's quantitative easing programs plumbed uncharted depths and caused any number of people, myself included, to worry that the result could be a lot of inflation and perhaps even a collapse of the dollar. Indeed, there was no shortage of reasons for why gold rose as much as it did. Most of the world's major central banks (with the notable exception of the Bank of Japan) became ultra-accomodative in the wake of the global financial crisis and recession. The Eurozone sovereign debt crisis that erupted in 2010 and 2011 threatened the dissolution of the euro, which by then had become one of the world's most important currencies. But one after one, the fears—of hyperinflation, a dollar collapse, or a euro collapse—fell by the wayside, and now the Fed is talking seriously about ending QE3 within a matter of months. In a bizarre twist, the Japanese central bank, which had been doggedly pursuing a mildly deflationary monetary policy for decades, is now committed to a reflationary policy. With the recent sharp weakening of the yen, gold in yen terms has finally reached the same level as it did in early 1980 in nominal terms, though it is still about 30% below the inflation-adjusted levels of early 1980. Looking ahead, as a first approximation I think gold could fall to $1000 or even less, as it realigns with other commodity prices (see second chart above). Gold bugs: look out below! There are undoubtedly a lot of speculative purchases that may need to be unwound in coming years.